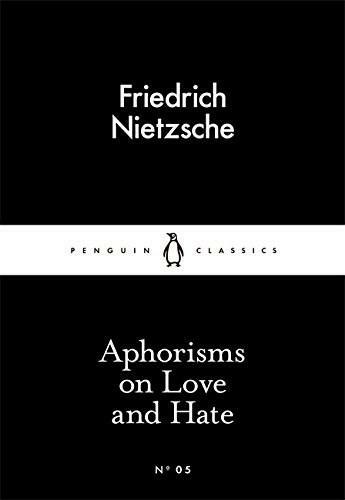 This volume contains a selection of Nietzsche's brilliant and challenging aphorisms, examining the pleasures of revenge, the falsity of pity, and the incompatibility of marriage with the philosophical life. Introducing Little Black Classics: 80 books for Penguin's 80th birthday. Little Black Classics celebrate the huge range and diversity of Penguin Classics, with books from around the world and across many centuries. They take us from a balloon ride over Victorian London to a garden of blossom in Japan, from Tierra del Fuego to 16th-century California and the Russian steppe. Here are stories lyrical and savage; poems epic and intimate; essays satirical and inspirational; and ideas that have shaped the lives of millions. Friedrich Nietzsche (1844-1900). Nietzsche's works available in Penguin Classics are A Nietzsche Reader, Beyond Good and Evil, Ecce Homo, Human, All Too Human, On the Genealogy of Morals, The Birth of Tragedy, The Portable Nietzsche, Thus Spoke Zarathustra, Twilight of Idols and Anti-Christ.